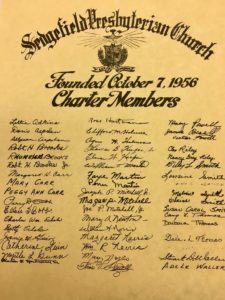 Sedgefield Presbyterian Church, a congregation of the Presbyterian Church (USA), was chartered on October 7, 1956 by Orange Presbytery, with 29 members who met at Sedgefield Elementary School. It moved to the current site in 1960. The preschool was established in 1959 and continues today under the direction of Korina McGill. Our Preschool serves as a valuable outreach to the community (and a good use of our physical facility). In the early 1990’s, the facility was expanded to include a new sanctuary, more classrooms, a youth room, offices, library, and new parlor. The courtyard created by the new structure was landscaped, and a bell tower and fountain were added in 1999. Our worship and ministry focuses on the acceptance of Scripture. We share our facilities with a Montagnard congregation, Bunong Alliance Church, and enjoy occasional joint services and events. In 2010 we embraced a new focus of ministry: partnering with Sedgefield Elementary School. This local school has many needs in its diverse population. We are a church of and those growing in discipleship. We all bring gifts of ministry to the church. Each quarter we offer a class that explores what it means to be a member of Sedgefield Presbyterian Church and the PCUSA. Live in harmony with one another; do not be haughty, but associate with the lowly; do not claim to be wiser than you are. Do not repay anyone evil for evil, but take thought for what is noble in the sight of all. If it is possible, so far as it depends on you, live peaceably with all.